A new season is just around the corner, and with the “break all the rules” rule of fashion, there’s no reason why you can’t wear these gorgeous colors sooner. Below we’ve compiled an exciting list of footwear that’s inspired by several hues from InStyle's coverage of the top ten colors for spring. With the publication’s material sourced from Pantone, the leading color trend expert, we’re sure the predictions are right on point, which makes us that much more excited to share our finds with you. This neutral hue just got an upgrade from a tint of purple, making this “it” color for spring a bit more soft, feminine, and wearable. We’ve toned down the daintiness this time by choosing a pair of wedge sneakers. 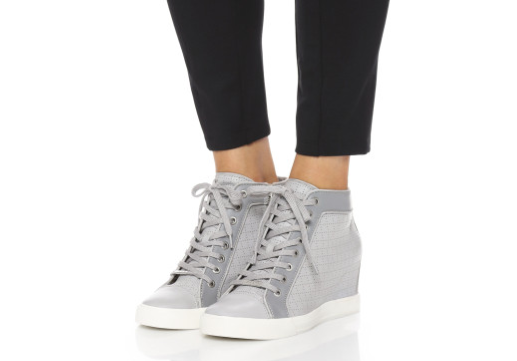 From the pages of Lyst, we’re bringing you the gray Cresta wedge sneakers from DKNY. These modern kicks are a beautiful option for wearing with skinny jeans, shorts, skirts, and more this spring. This colour is a soft powdery blue hue that was featured as part of Marchesa’s shoe launch recently reported on by Vogue. 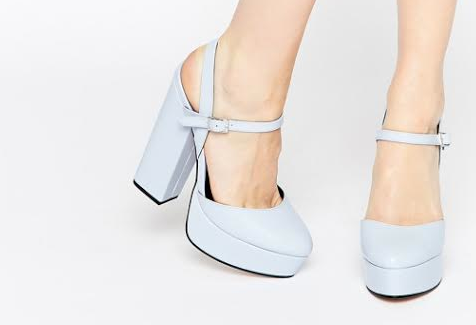 Our pick, although slightly less ethereal and dainty compared to the designer’s counterpart, the blue Prosper platforms from Asos are just as stylish. This retro pair would look great with all of your flirty shorts, skirts, and dresses in the spring season ahead, and the color is absolutely gorgeous. Opt for other pieces of pastel clothing to create a sherbert inspired outfit from head to toe. This soft blushing hue is a welcome addition to the top ten colors for spring and will look lovely when chosen for monochrome ensembles or when paired with other neutrals, like white, cream, black, and brown. 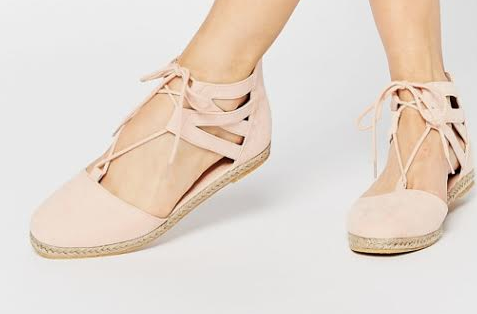 The pink Jessica Ghilie tie espadrilles from Asos have a ballet flat feel with the natural casualness from the raffia style base and keep the feminine touches alive with the strappy laced up details. If you don’t mind wearing a color that will remind you of delicious lattes all day long, then definitely choose ice coffee for the spring season. This creamy brown hue is a great neutral to pair with pastels, cream, or crisp white. The beautiful taupe Greyson gladiator sandals from Rebecca Minkoff will look darling with cropped skinnies, shorts, skirts, and more this spring. Peach is peachy keen for spring and will likely be the new coral of the season. The cheerful hue is a great choice to wear to brunches, weddings, and other daytime fetes. 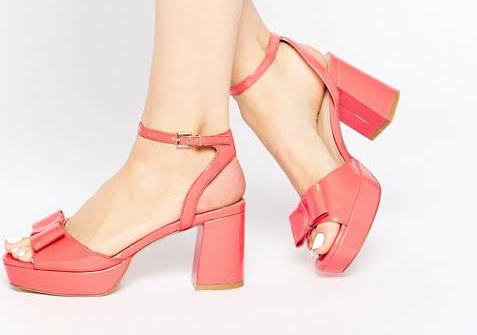 One of our favorite examples is the pink Happiness heeled sandals pictured above from Asos. This gorgeous and glossy pair of shoes will add instant femininity and sweetness to all of your outfits. With the insurgence of beautiful colors this spring, it’s going to be difficult to choose. Incorporating color into your footwear, though, is a fun and less expected way to inject these popular new hues. We hope that our suggestions above will provide some inspiration and ideas for what to wear when the weather warms up and that you enjoy the hunt for the perfect piece along the way.